Astelav, a leading European distributor of spare parts has achieved a nearly 50% cost reduction on parts procurement in its case study with Spare Parts 3D (SP3D). Founded in 1963, Astelav is an Italian family run company that supplies spare parts to household appliance manufacturers including Electrolux, Indesit, Smeg and Whirlpool. The company warehouses 25,000 parts references, and has more than 1,500,000 numbers in their catalogue, top-selling pieces as well as non-hit items. Astelav provides spare parts for household appliances for over 50 years. Astelav buys spare parts from suppliers, OEMs and non-OEMs. High-volume parts are cheap to obtain, but when it comes to long tails, it always causes a headache to most manufacturers. Long tails refer to the large number of parts that sell in small quantities. 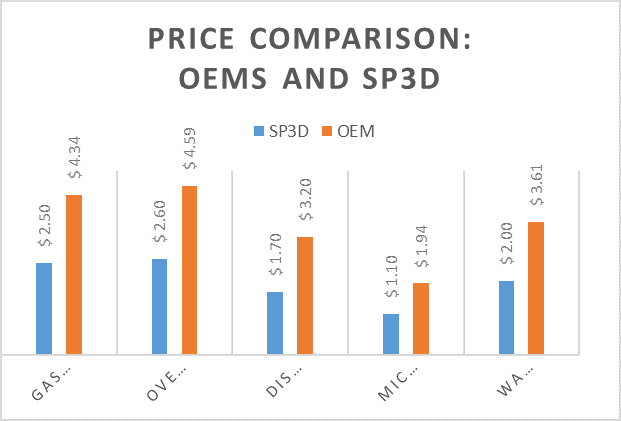 Due to low profitability, aftermarket suppliers except for OEMs, are not interested in the long tail sector, therefore giving OEMs a dominate position in the market to sell long-tail parts at high prices. Astelav’s margin is restricted. Yet Astelav cannot afford to give up the long tails market if it aims to commit a strong customer care. This is the reason why Astelav decided to investigate new ways of sourcing long-tails on-demand and got interested in 3D printing. SP3D supports on-demand and distributed production of home appliance spare parts using 3D printing through its global network of 3D printers that run a standardized production process. SP3D provides a cost-effective solution especially to long tails, obsolete and low-volume parts. No warehousing, no investment, last-mile transportation, ultimately producing the parts requires minimal energy, room, manpower, and materials. Thanks to this system, SP3D reduces the overall cost of spare parts while increasing their availability, compared with OEMs. Out of the eight spare parts selected by Astelav from different appliances and brands to conduct the case study, five demonstrated significant savings; two were not suitable for 3D printing and one was discarded from 3D printing production as it was not cost effective. In total, 3D printing enabled Astelav to reduce the purchasing cost of the parts up to 47%, compared with purchasing directly from the OEMs. 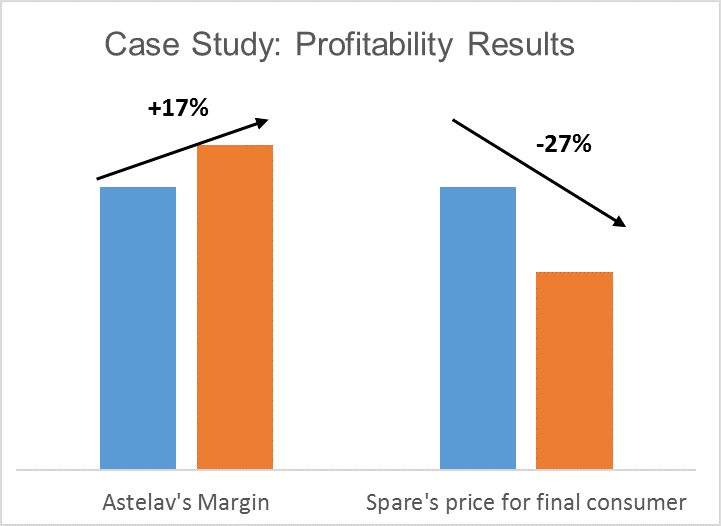 Given the cost reduction, Astelav was able to increase substantially its margin while reducing the parts’ prices by almost 30% for end consumers. Meanwhile, an online library of the parts gives Astelav the opportunity to avoid stock-out risk during the whole lifecycle of the products at a reasonable price. Overall SP3D reduced the purchasing price of the long-tails by 44% on average. It is likely that OEMs start to think about applying the strategy to ease their large amount of parts stock (several hundreds of thousands). They can brand the 3D printed parts with OEM labels and apply premium prices. The results of the case study being very positive, Astelav and SP3D decided to pursue their collaboration. Additive manufacturing is being deployed on relevant parts of Astelav’s catalogue, and the first batch of spares will soon be printed by SP3D’s providers in Italy. This collaboration is one step towards a new spare parts management system, more flexible and valuable for both customers and retailers.